In the comments of my recent post on the memoQ TM search tool, I mentioned a possibility for using that feature to "de-junk" and simplify concordance searches. I can separate the concordances for my project from a big reference dataset I only need for certain lookups. 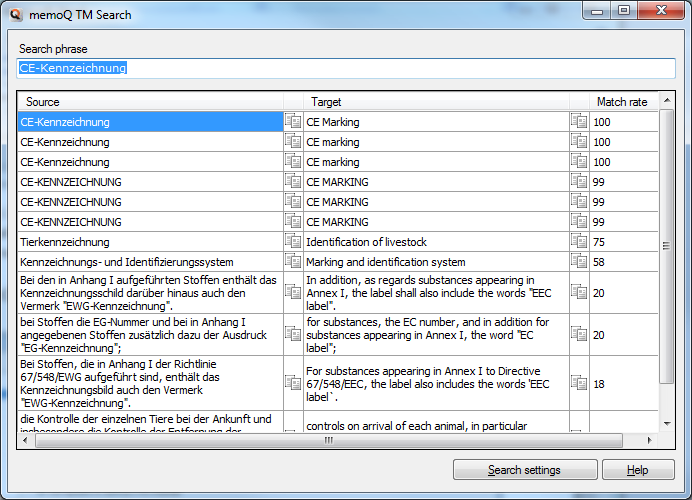 A simple copy command (Ctrl+C) automatically looks up text in either language in the TM search tool. If I want to avoid any possibility of unintended "leakage" of data from certain TMs in the project, selecting them for use in the memoQ TM search tool ensures that their content will never be "accidentally" inserted as an ordinary TM match as I work. Note also that I am using a feature of memoQ 2013 R2 (6.8) to do searches while working in an older version of memoQ. I could do the same if I were working in a web translation interface for memoQ (which does not allow me to attach my own TMs) or any other translation environment. In any case, the possibility of a separate concordance for handling large data volumes separately from one's main TMs and the possibility of doing this even while using older versions of memoQ may be a reason why those who do not yet want to do their routine work in the latest version or cannot do so can still benefit from upgrading now and installing the latest version alongside the old version(s).